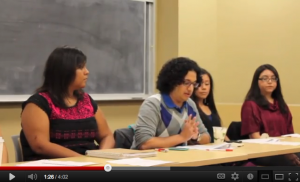 In the final part of our series looking at the “Opening the Blinds” panel – dealing with the experiences of students of color here at UT and previously highlighted here and here – we offer a conversation between Juan Portillo, organizer of the panel, and Amias Maldonado, blog editor and fellow scholar of gender and critical race theory. What was your reason for organizing this conference in the first place? Obviously UT has had a checkered past when it comes to issues of racial aggression macro or micro: you can still see the segregated bathrooms in the main building, you can still see the statues of Confederate nobility around the South Mall, but at the same time, it seems like there’s something new or different in the sort of ferocity or intensity of things that are going on right now. So do you see there being something new going on here in terms of the climate of the University or do you see this as ultimately part of a larger trend that we haven’t been paying attention to but has been festering in the shadows? I think it’s a little bit of both. I mean, it’s definitely something that never stopped. I mentioned a book during the presentation called “Integrating the 40 Acres,” and that book delineates the history of integration at UT and how the issues that students face today are still the same, they’re just being played out differently; we’re no longer fighting for the right to be here, but for the right to be really included. One way that I explain it is that students of color, female students, queer students, any kind of non-normative student is tolerated, right? That’s the kind of discourse around them. These are bodies that are supposed to be tolerated on campus, but that’s not the same as integrated, or included, or having the same kind of presence as others, right? Definitely. Sara Ahmed has this notion of institutional passing, where she talks about how in the diversity world, what’s important is for bodies to produce sameness, and insomuch as you don’t produce sameness, as you show yourself as different, that’s immediately read as threatening and racist in itself. So the responsibility is on the non-normative student to act in line with everyone else and sort of disavow or cover up their cultural heritage, their sexual orientation, etc. And that’s something that’s been going on. 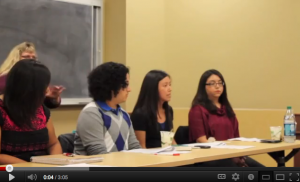 This sameness denies students a voice to actually speak up against injustice that is very real. People highlighting racial bias, gender bias, class bias at UT goes against some kind of fantasy that we’ve all bought into that everybody should be the same and that everybody is the same and that if we just don’t talk about the differences, marginalization will go away. I think another important part of the panel and your work is the role of space. A lot of times people think about race or gender as attached to bodies, you know, but it’s really not just on bodies, it’s also in matters of space, so I was wondering if you could talk a little about that, about how space can become raced and gendered. So most of my ideas about space and the way space is gendered and racialized came from Nirwal Puwar’s Space Invaders. Just listening to students of color or female students in male dominated fields like engineering and their experiences in the class – what they feel, how they feel, what people tell them – kind of uncovers or untangles all these forces of oppression that are still around. So just to be clear for the non-critical race scholars out there, when we’re saying that the University is a white male space, what do we mean by that? First of all, those bodies were inhabiting the space. It’s kind of a philosophical tradition to think that knowledge is disembodied. But in fact, knowledge happens through experience, through the person who is writing the book, through the lecturer talking to his class. So this space physically was reserved mostly for white male bodies from the inception of the University. They were creating knowledge and in doing so, they defined what counts as “real” knowledge. And this tradition carried on until finally it was challenged to include other bodies. Black bodies, female bodies, queer bodies, disabled bodies. And their inclusion transgressed this boundary that was set up around the University space. The only real bearers of knowledge were the white male bodies, but now we have women and people of color here and that crates an anxiety over who has the right to say what counts as the real truth. It’s a challenge to authority and to the authorship of knowledge. I want to go back to the importance of privilege real quick. To me, when you’re an ally for racial or social or sexual justice, it’s not that you will always say the right thing or you will always recognize your privilege but that you have to be open to interrogating yourself and interrogating the ways in which your own assumptions are informed by your privilege and be willing to critically analyze yourself. I think there’s a lot of tension around that for allies who believe in social justice that they want to sort of “cleanse themselves” of their complicity in these structures but the fact is, you can’t cleanse yourself. You just have to be open to recognizing your privilege. Would you agree with that? Yeah, I think one of the things that we wanted to also spotlight in the panel was that it’s important to turn the lens around on yourself. And whether you’re a researcher or not, we’re usually very comfortable analyzing others or analyzing situations as though we were not in it. But starting to understand how we are part of these institutions will have large repercussions on how we shape our institutions and communities. So talking about tackling oppression in the institution, one of the things I was struck by in the talk was how the women on the panel navigated their relationship to the University. In a class recently, we read a book about Black Panther Party health care initiatives. One of the things that they struggled with was this tension between wanting the legitimacy that came with federal funding and the desire to maintain a critical perspective on the medical-industrial complex as a whole. In the talk, you saw these same kinds of dialogues occurring within La Collectiva Feminil. They want to critique UT as an institution but at the same time there are some things to be gained by being part of the institution, so I wondered if you could speak to that tension of being a critic and being a revolutionary from the outside on the institution but at the same time wanting to sort of use institutional structure to create change from within as well. Well, the way I’ve heard a lot of people talk about this idea that to be revolutionary, you have to kind of oppose the institution. That once you become part of the institution you stop being revolutionary. That does explain part of it, but I feel that at a deeper level, what the panel exposed was that their resistance to being institutionalized is also an effort to maintain a particular consciousness. These are students coming from an experience that is way outside what we think the mainstream student would be or the mainstream professor would be. It’s almost like inhabiting a different dimension if that makes sense. These are women who identify as, or have created, a queer feminine space. Most of them are first generation college students. So I think there’s hope there in the sense that – and I can’t even begin to describe exactly what I think they’re doing and what I think their goals are because I haven’t had that experience – but I just know that they have something very special going on that necessitates further analysis with theories created in the margins. Yeah. Because there’s also another tension at work here that activist organizations have. This one is between wanting to change the system on a larger level but also for the members of that group, just wanting to have livable lives and to have that space to practice self-help, self-health, and to have a community that you can call your own without having to compromise. And that takes priority sometimes over these larger institutional issues because ultimately they’re just students that are trying to get through college. But I think both structures can co-exist as long as we don’t try to impose a particular definition of what they are right now and what they should be if they become part of the institution. They have a space and a consciousness through the members of that group that’s fluid, that recognizes – that thrives, actually – in ambivalence. Their very survival depends on embracing ambivalence which is something that UT as an institution doesn’t necessarily do. But UT doesn’t have to understand it to be able to work with the students. They don’t have to submit to all the rules to still work with UT and still be a positive influence at UT. So what was the experience of the panel that you organized? What did they think about the experience, what did they say to you afterwards? They were extremely happy. They felt like somebody listened to them, I think that was the main thing. That somebody was listening. I felt the same way. That somebody is listening and that transformations can happen. The fact that the panel was composed of a mixture of undergraduate and graduates students and a staff member of UT showed how we can have an intellectual and rigorous conversation that doesn’t have to be structured in a rigid academic way. So not just what we said, but how we said it and how the audience responded made all of us extremely, extremely happy. Even the audience members came to me later and they were like, “We never thought that these conversations could happen in this room, in this building, in this department.” But as far as the panelists go, they were very…..it was almost therapeutic in a way. It was a way to reconstitute themselves as human beings. 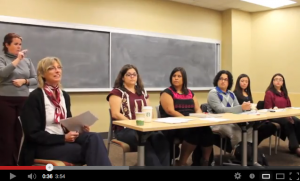 Who gave that amazing and troubling historical perspective on women of color faculty at UT. You don’t expect that kind of critical voice coming from an older white woman, but there she is. That’s an ally that if you just saw her passing in the hall, you would never know that you had that ally there. I also saw a man I know that does diversity work for the Division of Housing and Food at UT, so it speaks to the idea that there was a hunger and a need to sort of address the silence around these sorts of issues. Yeah, and the panelists definitely want to do more. Whether it’s just us talking about what happened and what to do next or whether it’s a new conversation entirely. And I know that here in the department, we also want to do more. Just follow this format – a format that’s more fluid, that can address different issues, different interests. There’s definitely some momentum here that we can take advantage of. As Wal-Mart gears up for its Black Friday sale, some employees are preparing to walk out. But other employees we spoke with in the Austin area fear they could lose their jobs for speaking their mind. The protests are organized by “Our Wal-Mart” a national group representing Wal-Mart employees.The group has the support of The United Food and Commercial Workers International Union. Wal-Mart employee Topaz Chambers is scheduled to work on Thanksgiving, but she wants people to know that working the holiday isn’t the only reason people are protesting. She makes $8.25 an hour and says it’s difficult to make ends meet. “I have to get personal loans just to pay my bills, so right now I’m kind of in debt, so I’m trying to pay those back. It’s really hard working here,” she says. Williams is skeptical because of Wal-Mart’s ability to fight against the formation of unions, but she does think the protests will help improve conditions. “I think by taking this job action, the workers at Wal-Mart will get more public sympathy and will get some concession so they can live a decent life on the jobs that they have,” she says. While college is often sold as the ticket to a better life, being a student at The University of Texas can also be a rough and violent experience. Recent bleach bombings against students of color, offensive sorority and fraternity race-themed parties, and the current attack on affirmative action can affect students’ sense of security, their sense of belonging in our imagined community, and their emotional well-being. At the same time, UT’s and Austin’s claim to a liberal mentality can serve to obscure or diminish the impact of these events, as well as the sense of alienation that students can and often feel. As a response to the current campus climate, on October 30, 2012, the Sociology Department organized a panel presentation and discussion, free and open to the public, to frame these and other issues in a way that allows us to unravel the many social forces that affect students, including race, gender, sexuality, and social class. In this panel, the presenters opened up a conversation to explore how race, gender, sexuality, and social class are experienced by students. First, Marianna Anaya and Marleen Villanueva provided narratives of their educational trajectories at UT, shedding light on their experiences as first generation college students, women of color, and student leaders. 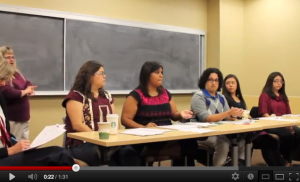 Rocio Villalobos then provided her perspective as a UT alum and as someone who now works for UT in a center that seeks to address issues such as racism, classism, sexism, and homophobia. Finally, Ganiva Reyes talked about her experiences teaching the only required course in the College of Education that addresses race, gender, sexuality, and other factors in teacher training. 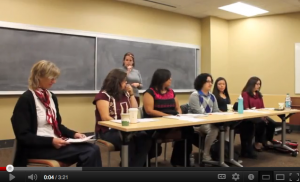 The panel was moderated by Dr Christine Williams, Chair of the Sociology Department. We hope that after the presentation, the panelists and the audience can continue to have conversations that further enrich our understanding of racism, sexism and classism, and what steps can be taken to address these problems. The Power, History, and Society network (PHS) of the Department of Sociology has initiated a “Middle East Working Group (ME Working Group).” Graduate coordinators, Amina Zarrugh and Hyun Jeong Ha, organized the first working group meeting on Friday, November 15th with the support of PHS faculty advisor Dr. Mounira M. Charrad. The ME Working Group promotes networking among faculty members and graduate students at the University of Texas at Austin whose research concerns the Middle East and North Africa. The ME Working Group aims to create an intellectually supportive forum among UT scholars and a space for constructive discussions of student work-in-progress, research by faculty guest speakers, and critical conversations about contemporary events in the region. The first ME Working Group meeting was attended by ten graduate students across disciplines including the departments of sociology, anthropology, government, history, Middle Eastern Studies, and Radio-Television-Film. The graduate students’ areas of specialization lie in politics, social movements, gender, and race/ethnicity issues in the region. 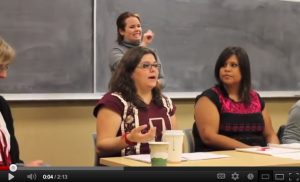 At the meeting, graduate students discussed upcoming plans for spring semester. The ME Working Group plans to have two graduate student presentations and one workshop with a professor visiting from the University of Oklahoma in the spring. Faculty members and graduate students who are interested in the ME Working Group are welcome to join the group and mailing list by contacting graduate coordinators: Amina Zarrugh at amina.zarrugh@utexas.edu and Hyun Jeong Ha at hjha@utexas.edu. Tripoli, Libya. Photo courtesy of Amina Zarrugh. Amina Zarrugh, a sociology graduate student at The University of Texas at Austin, focuses her research on gender, religion and nationalism in Libya. She has family roots in the capital city of Tripoli, Libya, where she frequently visits each summer to observe the atmosphere of politics and social life under the Gaddafi regime and during the revolution. A national survey released by the Pew Research Center last week illustrates increased skepticism among the American public regarding whether the Arab Spring will “benefit” the United States or the Middle East. This uncertainty stems in part from the recent attacks on the U.S. consulate in Benghazi. Discourses have questioned whether the Arab uprisings were really “worth it” given the loss of U.S. lives. Contrast these sentiments with the collective condemnations of the violence by Libyans, with statements like “Islam is not about killing innocent people” and “We demand justice for Stevens” appearing on signs in Benghazi and Tripoli “sympathy protests” following the attack. Each year the Population Research Center at The University of Texas at Austin, in collaboration with the Department of Sociology, hosts the Research Experience for Undergraduates (REU) program. This eight-week summer program, which is funded by a grant from the National Science Foundation, offers eight very selective upper-division undergraduate students from both UT-Austin and from around the country the opportunity to study social demography through course work and a mentored research experience with senior PRC graduate students. 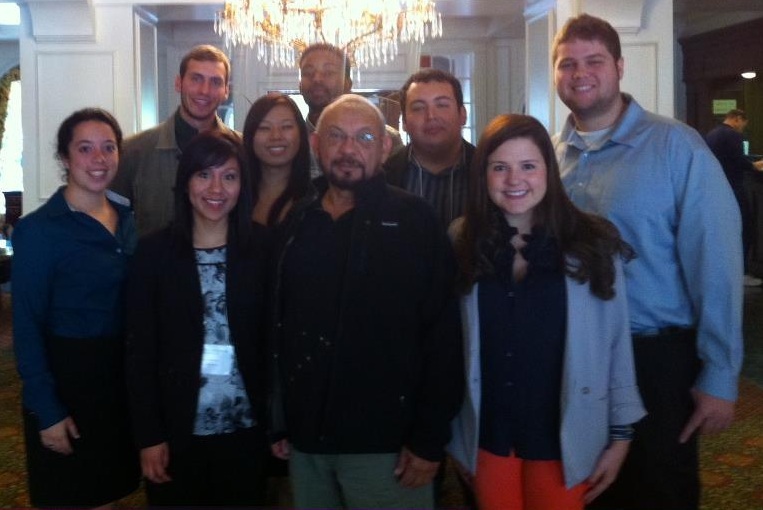 Student papers are then presented at the annual fall meeting of the Southern Demographic Association. This year three undergraduate sociology majors – Taylor Orth, Mario Guerra, and Sharron Wang – participated in the REU program and we invited them to share their experiences with the blog. Taylor Orth: The REU program gave me the opportunity to conduct independent research and provided me with the ultimate pre-graduate school experience. Throughout the program, we were taught through a variety of different classes, seminars and experiences. While being trained in the technical side through working with Stata and GIS software, we were also given field experience by taking a field trip to Houston to explore different racial and ethnic enclaves. Dr. Nestor Rodriguez and Dr. Rebecca Torres provided us with a mix of perspectives, and gave us a sociological as well as a geographical understanding of our topics and the subjects we approached in the classroom. I feel like the program really helped me to fully explore my interests before I take the leap of applying to graduate school. With such a strong support group, it was an excellent time to really find out what I wanted to study and to take risks with using difficult data and new types of analyses. In addition to the training we received, we were paired with graduate mentors who oversaw our research and guided us in making decisions regarding our own independent projects. My mentor David McClendon was especially helpful and assisted me in my project on fertility within interracial and interethnic marriages. After finishing our projects, we submitted them to the Southern Demographic Association conference. Attending the conference was a valuable experience, and we were each given the opportunity to present our research. For me, the most rewarding part was when I finished my presentation and one woman stayed around afterwards to speak with me. She informed me that she had come to the panel presentation because my topic was of particular interest to her, and she wanted to ask me additional questions and speak in detail after the presentation. It was exciting to think that someone was interested in something I had researched and it was nice to be able to share what I had learned. After having such a positive experience working with a diverse cohort of students as well as interacting daily with a faculty mentor, I became confident in my decision to attend graduate school. The program gave me all the tools that I needed to work independently, but also provided me with resources to fall back on when I needed help. With many long hours working in the PRC computer lab on our projects, our cohort of students developed a special bond, and were very happy to be reunited at the meeting in Williamsburg. I don’t think there could have been a better way to spend my summer. The program provided me with a research experience unavailable to undergraduates anywhere else. Mario Guerra: The REU program gave me a unique opportunity to learn the ins and outs of conducting research as well as presenting at a conference. In general, most students have written research papers for a class or two but conducting independent research takes this a step further as one tries to contribute to the work that may already be out there. After a summer of research focused workshops and seminars, we were then able to show off our work at the SDA conference. The summer program was an interesting experience as it allowed for a more intensive focus on independent research than did any other undergraduate class I have taken. The focus here was to prepare the students for their own research projects no matter what their background in statistics and demography may be. Due to the mix of students, our workshops were focused on training in both STATA and GIS in order to conduct our analysis. The summer months also gave us the opportunity to get to know other students from around the country who had similar interests as we did and were also eager to explore Austin. The resources over the summer also made the daunting task of independent research a more manageable experience. 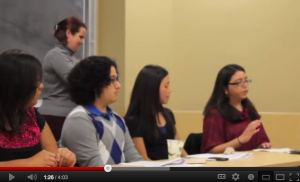 The fearless REU leaders Dr. Nestor Rodriguez and Dr. Rebecca Torres were always available to answer any questions. Additionally, our mentors and grad students in charge of workshops gave great advice and went above and beyond to help us. This October was our conference at SDA which was my first presentation at an actual conference. It was a great experience in not only presenting but simply being around that type of environment. Knowing that for two and a half days you could sit in on some pretty interesting presentations was great. As for the presentation, I feel that I was definitely a lot more nervous than I had to be. The many nights spent at local 24 hour coffee shops running data analysis and reading random articles on my topic had prepared me for the presentation. I found myself not needing to prepare as much as I thought seeing as I felt rather confident in the subject matter. This in turn made for a relatively smooth presentation. Seeing as my presentations was during the first student time slot, I was able to spend the rest of the time not worrying about the presentation. I was able to explore William and Marys right next door and hang out with the other REU students. In all, it was a wonderful experience that led to some great stories (like that we randomly said hi to the Dalai Lama although that’s not really REU related). We also made some great connections with professors and other students who had similar research interests. Personally, the program really solidified the idea that as a sociology major applying to graduate schools, this type of research is something I enjoy doing. 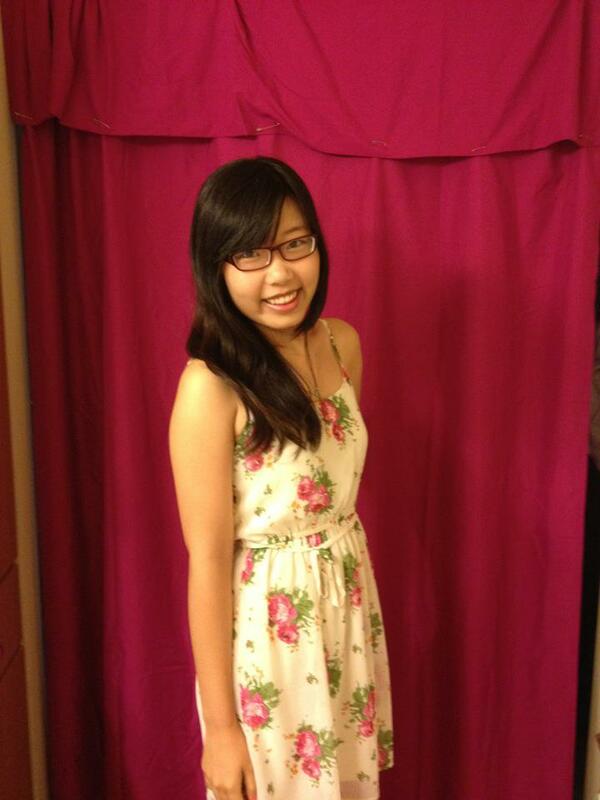 The REU program is very special to me because it gave me the confidence to do sociological research in the future. My first major was economics. After adding sociology as my second major, I was eager to find an opportunity to conduct sociological research. I enjoyed reading sociological literature; however, I was not sure if I would be able to do research or not. Fortunately, I had the opportunity to participate in the REU program. All the classes and sessions I took in the REU program equipped me with the knowledge and skills to do independent research. I also got a taste of how joyful it can be after I ran data analyses successfully. The moment I saw results appear on my screen, I became sure that doing research is for me and that I want to pursue it. Even though I had some difficulties finding available data and supporting theories for my topic, our supervisor, Dr. Rodriguez, Molly, and Joseph were very supportive. They gave me helpful insight and lots of courage that help me persevere through all the difficulties. The October SDA meeting was a unique opportunity for me to practice presenting my research and listen to outstanding research presentations. I was deeply impressed by the academic atmosphere in the conference. I also got much valuable feedback from other researchers for my research. I want to thank the REU very much for giving me this wonderful experience and the courage to pursue my interest in researching. The entire program was an unforgettable experience.